We have a new feature on the New Wave Feminists Facebook page: every Friday is #FionaFriday. 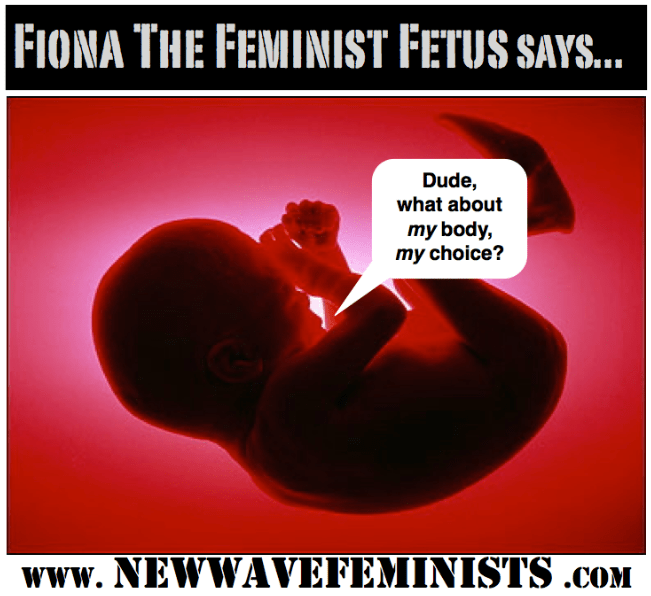 Our fearless leader Destiny adds a new quote to Fiona the Feminist Fetus’s little fetal thought bubble, and so far it has provoked a lot of discussion. And a lot of trolls. The NWF page is intended as an online meeting place for the like-minded (pro-life feminists), rather than a place where we have to constantly defend our beliefs from a barrage of angry fauxminists. We get enough of that in real life. But something about the recent Fiona image, pictured above, drew the haters out of the woodwork, and had Destiny blocking and deleting ugly comments. No such thing as a feminist fetus. Fetuses don’t get choices. They don’t have sentience or self-awareness. In order to have a choice, much less make a choice, you need to have sentience and experience self-awareness. At best this image just makes for good stand-up comedy. My first thought when I read this was: what good is self-awareness if it doesn’t stop you from killing children?